Mobile joints, stable bones, smooth skin, glossy hair and healthy finger nails – the collagen proteins that ensure these are elementary components of the human body. Thus, for the sake of health, it is essential to take collagen proteins in adequate amounts with our daily food. Especially in the form of short-chained peptides, these collagen products can be optimized for specific health effects. They can easily be incorporated into food stuffs and nutritional supplements where they can contribute to overall health. The ingredients in tablet get absorbed through the blood, stimulate the anabolic phase of chondrocytes, and initiate the repairing process thereby restoring joint health. This is a synergistic joint-relieving product and helps repair joint damage mostly useful in Osteoporosis and Osteoarthritis. Osteoarthritis is a joint pain inflammation that results from cartilage degeneration. It is a degenerative joint disease characterized by breakdown of the joint cartilage; causes pain, swelling, and reduced motion in joints. It can occur in any joint, but usually it affects hands, knees, hips or spine. This is an ideal dietary supplement for people with knee pain and is a remarkable example of nutritional science – being a delicately balanced formula to improve bone and joint health and combating debilitating bone-joint diseases. In today's busy life style and untimely food habits people are not able to take a balanced diet with recommended servings of fruits and vegetables i.e. do not get proper nutrition as a result they may become deficient of essential supplements which are required for human beings which may lead to deficiency and life style problems. Many people's suffering from arthritis including osteoarthritis and rheumatoid arthritis have considered taking vitamins and minerals promised to ease joint related problems. Glucosamine Sulphate Sodium & Chondroitin sulphatecomprises the cartilage matrix found in joints. The cartilage undergoes constant breakdown and repair. Rose hip contains galactolipids which may help for cartilage breakdown in joints. Sodium Hyaluronate with Chondroitin Sulphate reduces the inflammation associated with Osteoarthritis. Vitamin C is required in the synthesis of collagen in connective tissue, and reduces the symptoms of arthritis. Like many people's suffering from arthritis including osteoarthritis and rheumatoid arthritis have considered taking vitamins and minerals promised to ease joint related problems. Our supplement is well designed to exert positive effects. Some researchers have pointed out the benefits of this combination in many clinical trials. Our combination also postulates that this supplement can actually ward off or slow down the progression of joint damage. Overall, it appears that this supplement is most effective in consumers with arthritis. So this supplement is useful for relief from arthritic pain and stiffness, and also used to treat joint pain, osteoarthritis. Glucosamine is an amino sugar (amino-saccharide) which is acted upon by enzymes to create chains of different molecules which form proteins and lipids (fats). Glucosamine is a naturally occurring sponge like compound helping to maintain joint cushioning, flexibility and integrity, commonly sold as dietary supplements. It possesses properties that help promote and maintain the structure and function of joints in the body and may also have anti-inflammatory activity.Glucosamine is produced naturally in the body however; there are no major food sources of this substance. Glucosamine is a major structural component within joint tissue found in synovial fluid, tendons, ligaments and muscles. Glucosamine is the starting point of the synthesis of several important macromolecules including glycoproteins, glycolipids and glycosaminoglycans. Rose hips are the small fruits that appear on a rose plant after blossoming. They look similar to tiny pomegranates or tomatoes, growing at the tip of the stem, and are red or orange in color. The immune system can contribute to rheumatic diseases. An inflammatory cytokine called Interleukin 1-Beta (IL-1β) causes cartilage cells to produce proteins that digest and break down join tissue. In moderation, this process encourages cell turnover, but in excess, this process contributes to long-term joint tissue degradation, which is what causes joint problems. While rose hip doesn't reduce IL-1β levels in the blood, it interferes with its ability to activate catabolic proteins. Use: Rose hip alleviates joint pain through its immunosuppressive effects. 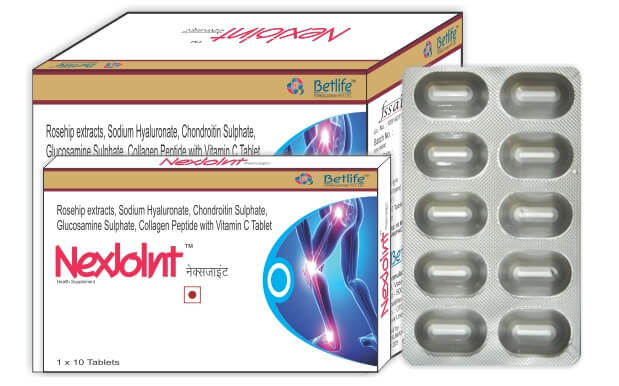 Chondroitin is a component of human connective tissues found in cartilage and bone, which helps cushion your joints and prevent your bones from rubbing against each other. Chondroitin absorbs water and other fluids, which helps keep your cartilage hydrated and healthy. It's taken as a supplement to treat osteoarthritis, a form of arthritis that results from the breakdown of cartilage. It is s part of a protein molecule that helps give cartilage its elastic properties and is thought to have an anti-inflammatory effect, which can help to reduce the painful swelling in the joints that occurs when the exposed bones in the joint rub together. In addition, chondroitin sulfate may also help slow the breakdown of cartilage and help restore cartilage growth to better cushion the joints. Use: Reduces pain and inflammation, improves joint function and slows progression of osteoarthritis (OA). Collagen peptideis produced by the enzymatic hydrolysis of Collagenous tissues derived from natural sources. Collagen is a key protein that ensures cohesion, elasticity and regeneration of skin, cartilage, bone, tendons, ligaments, blood vessels, etc. Collagen is a protein structure that forms a fibrous network throughout your body that ties all your parts together – keeping you all in one piece. Collagen peptideis a protein which constitutes 30 % of body protein. Collagen is the main building protein in bone, cartilage, skin and other connective tissues. The loss of collagen from body develops wrinkles on skin, makes bones brittle (osteoarthritis), accelerates degeneration of joint cartilage etc. Vitamin C is an antioxidant that helps support the immune system and helps neutralize free radicals in the body. Free radicals can form when air pollution enters the lungs, and evidence suggests they play a role in heart disease, cancer and even respiratory ailments. Antioxidants can bind to free radicals, counteracting them before they damage cells. Additionally, vitamin C is necessary for the body to manufacture collagen, which is important for healthy skin. Vitamin C is required in the synthesis of collagen in connective tissue, neurotransmitters, steroid hormones, carnitine, and conversion of cholesterol to bile acids and enhances iron bioavailability. Ascorbic acid is a great antioxidant and helps protect the body against pollutants. Vitamin C is responsible for producing collagen present in bones, cartilage, skin, tendons, ligaments, blood vessels, etc. It also helps the transformation of Proline to Hydroxyproline during collagen synthesis in the body. Use: Antioxidant and helps protect the body against pollutants. Sodium hyaluronate (also known as hyaluronic acid or hyaluronan) is a natural substance. It is present in the body wherever moisture is stored or lubrication between layers of tissue is required to eliminate friction. Sodium hyaluronate is similar to the fluid that surrounds the joints in your body. This fluid acts as a lubricant, shock absorber and a filter controlling the movement of cells and large molecules within the joint.It is used to treat knee pain caused by osteoarthritis. It may help to visualize sodium hyaluronate as a dish of spaghetti (this is what the molecules look like under an electronic microscope): a dense mesh that remains elastic and flexible in spite of its density and interwoven structure. Sodium hyaluronate takes on a variety of functions: It works by acting as a cushion and lubricant in the joints and other tissues. In addition, it might affect the way the body responds to injury.